Web Content provides you with the ability to create pages on your website with templates for Blog, Coupon/Deals, Job Postings, News and other ideas you create. You may add additional content types as needed to your database, then include them on your web-site, or the Info Hub or both. Job Postings – list of employment opportunities in your area. You may create separate content types, for instance, you may wish to showcase just your association postings on one page and have a separate type for your member postings. Coupons/Deals – list of specials or online coupons. You may have one type for members only and another page listing deals available to any website viewer. News – list of announcements, articles, newsletters or any other type of post. Create a news type for your association newsletters and create another for membership announcements. Blog – a simple posting feature for creating blog posts. Note: Blog does not currently contain ability to comment. Testimonials – share your membership stories. Include their logo/photo. Or use as a member of the month posting. On installation of the software, standard content types (Job Postings, Coupons/Deals, News, Blog and Testimonial) are in your database. Content Types are used to organize your content on the web, as well as report and filter within the software. To begin using these, you will need to enable their use. Click Web Content in the Navigation Panel. Click the Add Common Lists button. 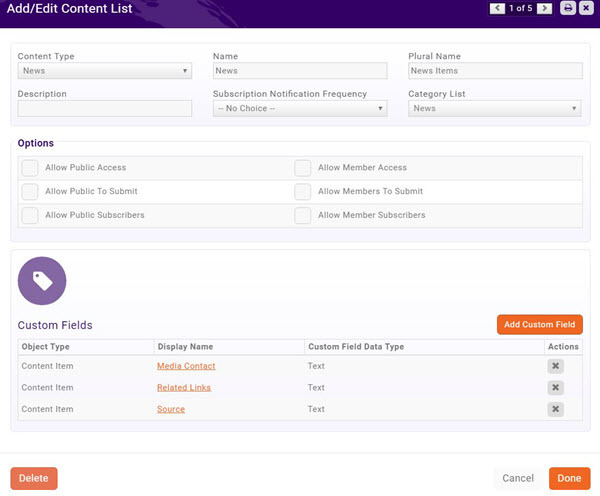 Select the content types that you wish to enable on the Setup Common Content screen. NOTE: You may rename the lists to meet your business process. For Example: if you prefer you may change "Job Postings" to be listed as "Careers" instead of "Jobs". Once you refresh/reload the Web Content page, you will see that a new tab is created for each content type you add. NOTE: If you have changed the name of the content lists, for example you have renamed Jobs to Careers, the tabs will reflect your customization. You may associate a new content type to existing content lists. For example, you may wish to have multiple News content lists, perhaps one for members and one for the public. Content Type - Select the common content type to which you want to associate this list. Name - Enter a name for this list. This name will be displayed on the web-site and Info Hub. Plural Name - Enter the name for this list that will be used when it is to be plural. Description - Enter a description of this list. This may be displayed on your web-site. Optional Hub Icon - You may enter a a Font Awesome icon (Version 5.0.12 or less) to be displayed on the navigation panel for this item in the Info Hub. For Example: Entering fa-shopping-basket will display a shopping basket in the Info Hub menu, as shown below. Visit the Font Awesome website for a complete list of icons. The icons you choose must be for supported FREE icons version 5.0.12 or less. Subscription Notification Frequency - For those subscribed to this list, select when they will be notified of additions to the list. As It Happens provides an instant alert to the subscriber. Note: The database is seeded with three lists (Public Subscriptions for Hot Deals, Public Subscriptions for Job Postings, Public Subscriptions for Blog Posts) to which you may allow members and the public to subscribe. When new web content is approved, the automated email message Web Content Published will be sent to those who have subscribed. Category List - Select the category to which this list belongs. The category will be used for display on your web-page (For example, you could create a category for restaurants for Hot Deals; or a category called full-time for Job Postings), reporting and filtering. A new category may be created dynamically by clicking the + button. Options - the options allow you to define whether members, public or both may view/add to this list. Allow Public Access - Select this option if the general public is allowed to access this content list. Allow Public To Submit - Select this option you wish to to allow the general public to submit to this list. Allow Public Subscribers - Select this option if you wish to allow the general public to subscribe to this list. When selected, the public will be able to subscribe, and will become member of the public subscription lists (Public Subscriptions for Hot Deals, Public Subscriptions for Job Postings, Public Subscriptions for Blog Posts) dependent on the type of content list you are creating. 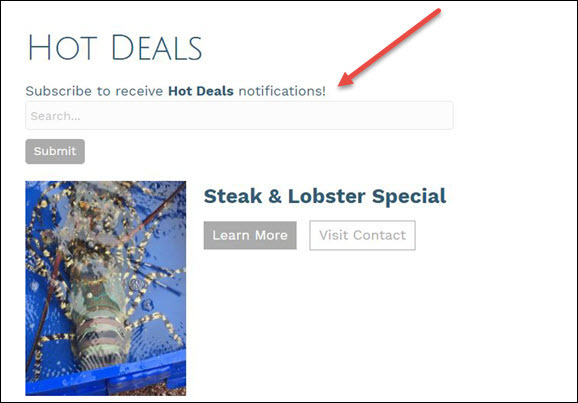 When you display the content list on your public web-site the link Subscribe to receive Hot Deals notifications! will be included on the page. See Public Subscription to Web Content for further details. Allow Member Access - Select this option if you wish to display this list on Info Hub. If you are setting up Member to Member content, you would select this option and not selecting Allow Public Access option. Allow Members To Submit - Select this option if you wish to allow your members to submit content for this list. If selected, a button will be displayed on Info Hub to allow them to do so. Dependent on the access level granted to the member, the content may be automatically approved or require approval from the back office. Allow Member Subscribers - Select this option to allow your members to subscribe (receive notification) to this list. When selected, the member will be able to subscribe, and will become member of the public subscription lists (Public Subscriptions for Hot Deals, Public Subscriptions for Job Postings, Public Subscriptions for Blog Posts) dependent on the type of content list you are creating. Custom Fields - Add custom fields as desired. By default, system generated custom fields include: Expire Date and Promo Code. Click the Add Custom Field button to add a new field. Click Done to save the new content list type. When you have created a content list type, default custom fields are included based on the type of content list you have created. For Example, the News content list type includes fields for Media Contact, Related Links, and Source. You may add additional custom field to meet your business needs. Click the hyper-link for the list you wish to customize. The Add/Edit Content List screen will display. A list of the custom fields that have already been included by default is displayed. If you will not be using the default custom fields, you can click the X button adjacent to the field to delete it. Alternately, if you would like to see how a default custom field is configured, click its hyper-link. 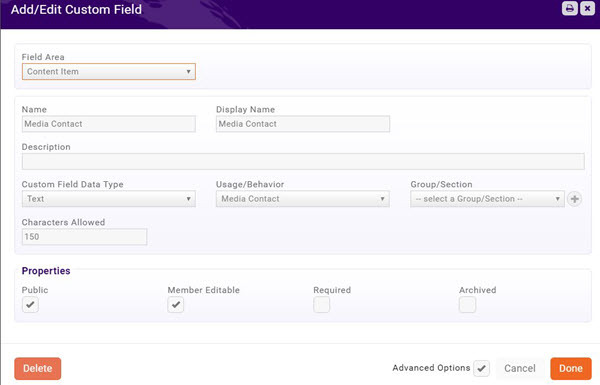 And example of the Media Contact custom field is shown below. Add additional custom fields by clicking the Add Custom Field button. The Add/Edit Custom Fields screen will display. Field Area - Field Area will default to Content Item. Do not change this as your goal is to display this field in your content list. Name - Enter a name for this field. This is the database name. Display Name - This is the name that will display on the web-site/Info Hub. Custom Field Data Type - Select the type of data this field will hold. Description - Optional, provide a description of this field. This is for informational purposes. Characters Allowed - This option will be displayed if you have selected Text or Multi-line Text as the Custom Field Data Type and allows you to set the number of characters that may be entered. You must enter a value in this field. Properties - Click the Required check-box if this custom field must be filled in. Advanced Options - Additional settings for this custom field may be configured by clicking the Advanced Options check-box. 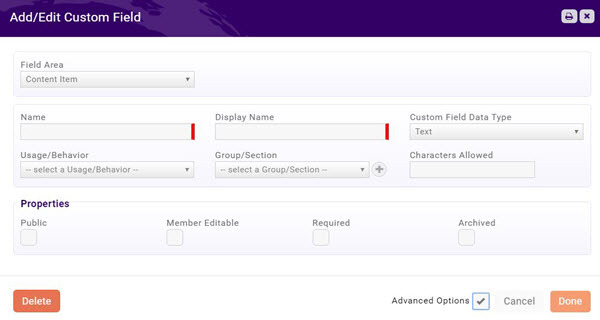 Member Editable - If you wish to allow members to edit the custom field in Info Hub, select this check-box. Public - Select this check-box if this field is to be displayed publicly. Archived - If you no longer wish to use this field, you may archive the field. This should be the option if you have previously used the field, and wish to maintain the historical data, rather than simply deleting the field. Click Done once you have completed the custom field. You may add additional custom fields as needed by repeating the steps above. Content categories provide a way for filtering content on your web-site, as well as allow for better reporting and analysis. Setting up category lists is a two step process. First you will create the list, then you will add categories to that list. Click Category Lists in the Categories section. Several Category Lists are included in the database on installation. Select Content from the Category Type drop-down list. Enter a Name for this category list. Select the text box for Can be Used Publicly if you wish to allow your members to select this option when submitting content in the Info Hub. Select the Is Active check-box to enable use of this list. If you no longer wish to use a category list, best practice is to de-activate the list. Enter a Description, this is optional. Click Done. Your new category list is now displayed. Click the hyper-link for the new category list. The Category Items dialog box will be displayed. Click Add to add an individual category OR click Add Multiple to add a list of items (shown below). 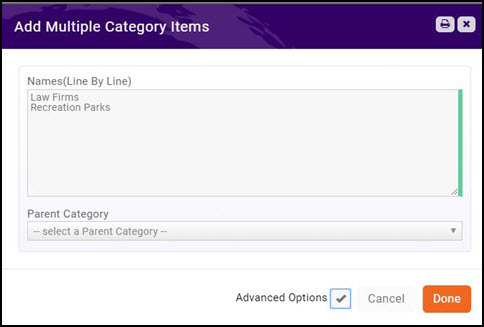 Enter the names of your category items (one per line). If you have selected to add an individual item, you will only enter one item. New web content may be added from the back-office, as well as in Info Hub. The following section describes how to add content from the back-office. News Items allow you to keep your members and the public up to date on the latest news and information about your members, community and association. News may be a list of announcements, articles, newsletters or any other type of post. Click the News Items tab. If you have provided a custom name for News when creating your content types, your custom name will be displayed on the tab. In the image below, News has been renamed What's New. Additionally, if the News tab is not displayed, you will need to enable it as a content type. Refer to: Enabling Common Content Types. Contact - Enter a Contact's name. The software's type ahead functionality will display options as you type. Content Status - Select status of this content. The content will not display on your web-sites until status is marked as Approved. Title/Subtitle - Enter a title and subtitle. Both of these will be displayed on your website. Tags - Add tags to enable filtering and searching. Description - Provide a description. This is the content of your news item. Search Description / Teaser Text - this is the description that will appear when the list of news items is initially displayed. Content Date - Enter the date the content was created. Publish Start - Enter the date the content should start being published to your web-site. Publish End - Enter the end date for the publication of this content. Note: the Web Content Pre Expiration Notice automated email will be sent to the contact three days prior to the Publish End. Within the email will be a link, that will take them to the Info Hub where they could update the news item end date. Require Approval After Edit - if your designated staff must approve the content prior to publication, click this check-box. Category - Select a category(s) from the list. Categories provide a way for the public to search your news content, and also allow you to easily report and analyze on web content submissions. Click Here for details on setting up categories. 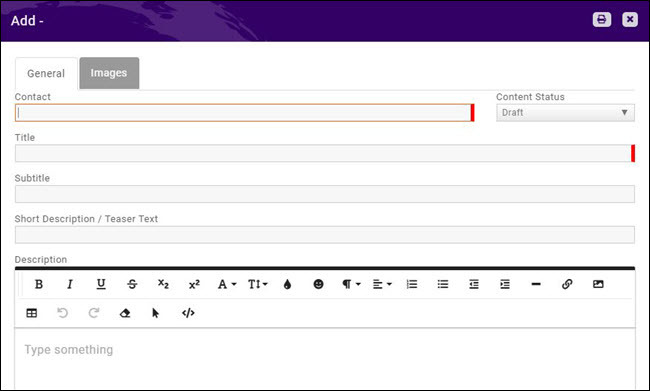 Custom Fields - default custom fields have been included for each content type. You may remove these fields when setting up your content types and add additional fields as desired. Refer to Customizing Content List Types for details on adding custom fields. 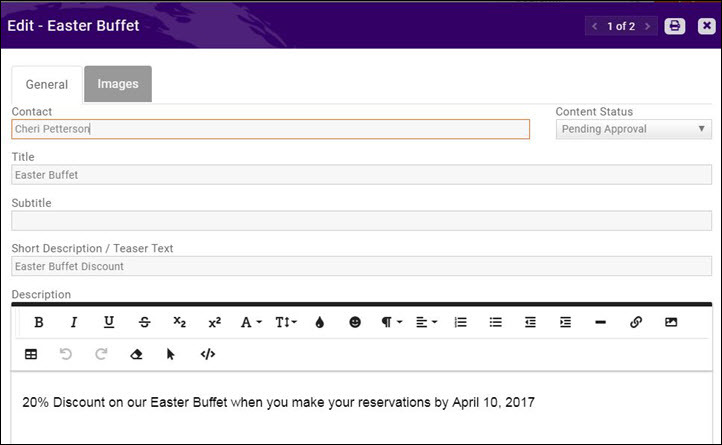 Media Contact - This is a default optional custom field. Related Links - This is a default optional custom field. Source - This is a default optional custom field. Additional Custom fields - any custom fields you have added to the content type will be displayed for configuration. Click the Images tab to add images to your news item. Click the to drag & drop or upload an image. Crop & Save the image. Click Done when you have completed configuration of the news item. Blogs are a great way of engaging your members, and allowing them to have a voice. Additionally, blogs allow for immediate delivery of information. NOTE: If the Blog tab is not displayed, you will need to enable it as a content type. Refer to: Enabling Common Content Types. Content Status - Select status of this blog. The content will not display on your web-sites until status is marked as Approved. Description - Provide a description. This describes the purpose of the blog and will be published to your site. Content Date - Enter the date the blog was created. Publish Start - Enter the date the blog should start to be published to your sites. Publish End - Enter the end date for the publication of this content. Note: the Web Content Pre Expiration Notice automated email will be sent to the contact three days prior to the Publish End. Within the email will be a link, that will take them to the Info Hub where they could update the blog end date. Category - Select a category(s) from the list. Categories provide a way to report, search and filter blogs. Click Here for details on setting up categories. Click Done when you have completed configuration. NOTE: If you have added custom fields to your content lists, these will also be displayed for you to configure. Refer to Customizing Content List Types for details on adding custom fields. NOTE: If you have renamed Coupons when setting up your content types, your custom name for coupons will be displayed on the tab. Additionally, if the Coupons tab is not displayed, you will need to enable it as a content type. Refer to: Enabling Common Content Types. Content Status - Select status of this deal. The content will not display on your web-sites until status is marked as Approved. Short Description/Teaser Text - Add a short description of the coupon. The short description is displayed under the title on the search page, and is searched when the user enters search criteria on the coupons page. Description - Provide a description. This will be published to your site. Search Description / Teaser Text - Enter the text that you wish to display when the coupon is shown in search. Content Date - Enter the date the coupon was created. Publish Start - Enter the date the coupon is published to your web-site. Publish End - Enter the end date the coupon will no longer be published to your web-site. Note: the Web Content Pre Expiration Notice automated email will be sent to the contact three days prior to the Publish End. Within the email will be a link, that will take them to the Info Hub where they could update the coupon publication end date. Category - Select a category(s) from the list. Categories will allow users and the public to easily search the coupons list. Click Here for details on setting up categories. Expire Date - This is an optional custom field. If you have removed the field from your Content List custom fields, it will not display for configuration. Promo Code - This is an optional custom field. If you have removed the field from your Content List custom fields, it will not display for configuration. Click the Images tab to add images to your coupon. Testimonials are a great way to attract new members, and retain existing members. NOTE: If the Testimonials tab is not displayed, you will need to enable it as a content type. Refer to: Enabling Common Content Types. Content Status - Select status of this testimonial. The content will not display on your web-sites until status is marked as Approved. Description - Provide a description. This is the testimonial, and will display on your web-site. Content Date - Enter the date the testimonial was created. Publish Start - Enter the date the testimonial should start to be published to your sites. Publish End - Enter the end date for the testimonial to be published. Note: the Web Content Pre Expiration Notice automated email will be sent to the contact three days prior to the Publish End. Within the email will be a link, that will take them to the Info Hub where they could update the testimonial publication end date. Category - Select a category(s) from the list. Categories provide a way to report, search and filter testimonials. Click Here for details on setting up categories. Click the Images tab to add images to your testimonial. Click the Job Postings tab. NOTE: If you have renamed Job Postings when setting up your content lists, the name of the tab will reflect the your customized names for job postings. Contact:Enter the contact name. Type ahead functionality will search the database for you. This may be an individual or an organization. Content Status: Select the desired status. Description: Enter the job description. Title: Enter the job title. This will be displayed in the job postings search results. Subtitle: (Optional) Enter a subtitle. Short Description / Teaser Text: (Optional) Enter a short description of the job. The short description is displayed in the search results. The short description is also used when your job postings are searched. Description: Enter the description of the job. Viewable Published Date: This date is displayed with the job posting to notify the user of when the content was published. This is visible in the search results within the Info Hub. Publish Start: Enter the first day this job posting will be published. Publish End: Enter the last day this job posting will be published. Note: the Web Content Pre Expiration Notice automated email will be sent to the contact three days prior to the Publish End. Within the email will be a link, that will take them to the Info Hub where they could update the job posting publication end date. Require Approval After Edit: If the user modifies content after it has been approved, select this check-box to require your approval of the change. Categories: (Optional) Select the desired category for this job posting. Categories provide a way to report, search and filter job postings. Click Here for details on setting up categories. Featured: This option is available with v2 of the public modules. Enable this option if you would like to display "Featured" for this job on your web-site. If Featured is select, enter the Featured End Date. This will be the date the Featured tag will be removed. Custom Fields: If you have included custom fields, enter or choose the appropriate information. (Optional) Click the Images tab to upload an image for the job posting. Members may enter web content via the Info Hub. Members who are given Full Control overall to the Info Hub, or Full Control to Info Hub Web Content may submit web content without requiring approval from your association. A member with Create access to Info Hub Web Content may enter web content, but your approval is required before the content will be made public. See Setup Info Hub Access for further information on assigning permissions to your members. Association staff responsible for approving web-content should subscribe to the User Created or Modified Web Content email notification. As soon as a member submits web content a notification will be sent to the staff who can then go to the Web Content module to approve the content submission. For Example: The email below is sent when a new hot deal is added via the Info Hub. Click Web Content in the left hand navigation panel. Click the tab for the appropriate web content. For Example: click Hot Deals. NOTE: Hot Deals in this example is the customization for Coupon Deals content type. The tab is your software will display the name that you have entered for coupon deals content type. The Hot Deals tab will display all of your hot deals, the Content Status column displays the current state of the hot deal. Click the title of the hot deal you wish to approve. On the edit screen, you can review the submission, make edits, and approve the submission. To approve the status of the submission, click the Content Status drop-down. NOTE: After staff approved web content, the Web Content Approved automated message will be sent to the user who submitted the content. Click Setup in the left hand navigation panel. Click the Actions button for your CMS and select Module/Pages. Site Module Type - Select Content from the list. Module Version: Select the version (V1 or V2) that you wish to use for your web content pages. If V2 is selected, you can also select the Default Public Layout for your web-content (Small List, Medium List or Grid). Content List - Select the desired content list. Title - Enter a title for the new content. This title will be displayed on the web-site. Relative Path - Enter a name for this content. This will be used to build the path for the content, recommendation is that this relative path be a shortened version of the title. For Example: If you have named this content "My Association Blog", you may simply enter "Blog" as your relative path. Template - Select a design template from the list. The list will be populated with templates you have previously created. 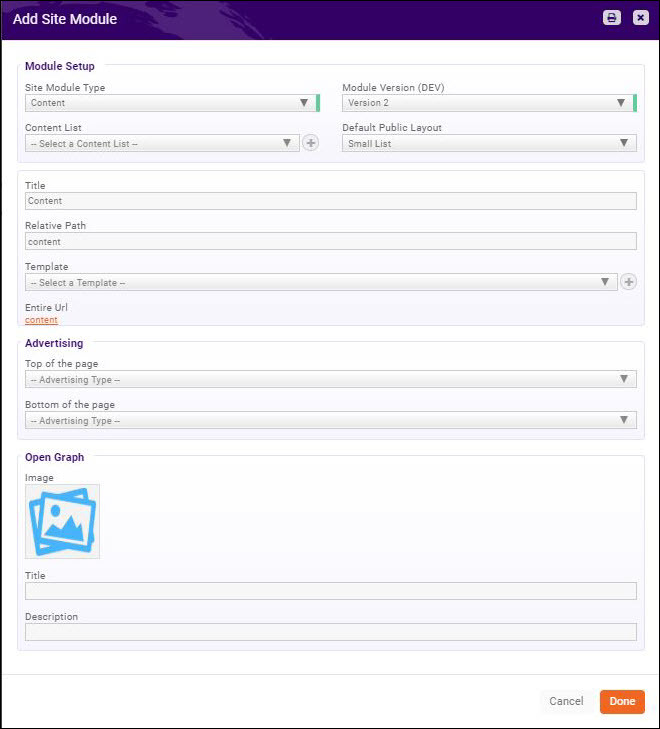 Advertising - If using the Sponsorship Module, you may configure the Advertising Type that will be displayed at the Top of the Page, and at the advertisement type to be displayed at the Bottom of the Page. Click Done. Your new page will display on the list of Site Modules. Click the hyper-link for your new page, to copy the url for the content. When you configure your Web Content for Allow Public Subscribers, and include the content list on your web-page, a subscription link will automatically be displayed on the content page. 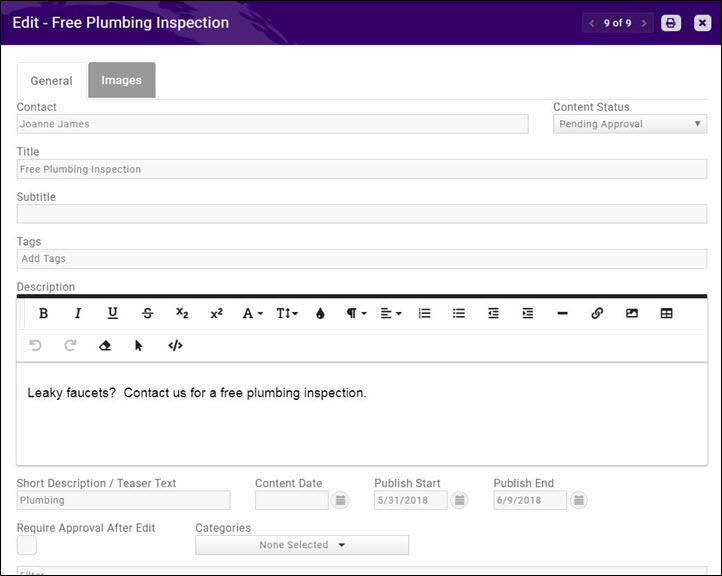 See Add a New Content Type List for information on configuring content for public subscription. Once subscribers click the subscribe link, they are prompted to enter their email and submit. An email is sent to the subscribers, within which is a link for to confirm the subscription. In addition to the new email subscription list, any other lists to which the user has subscribed will be displayed. The user may choose to opt out of subscriptions as desired. NOTE: Each email notifying the subscriber of new content will also include your public disclaimer and opt-out option. See Configure your Unsubscribe Message for information on the public disclaimer. 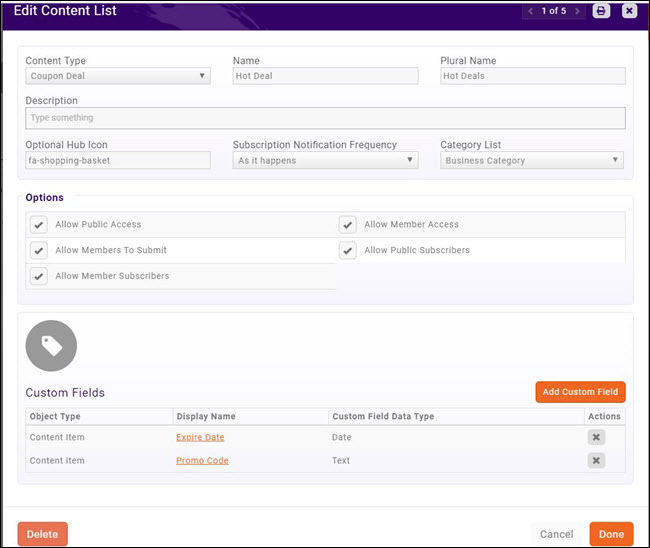 A list of category Content List Subscriptions will be dynamically created in your database the first time someone subscribes. The name of the list be Public Subscription for <name of content type>. The Web Content Activity Report allows you to generate statistics on web content use. You will be able to view content items that were recently entered, content that is expiring soon, activity for specific web content types (Blogs, Hot Deal, Job Postings, etc.). Select Web Content Activity Report. Select your search filtering criteria. For example, you may wish to view a specific Content Type. This page was last modified on 3 April 2019, at 10:18.